Dauer larvae display characteristic behaviors that maximize their survival and dispersal to new, more hospitable, environments. Dauer-characteristic behaviors have been reported for sensory behaviors, locomotion, feeding and nictation behavior. Chemosensory attraction is a major determinant for host tracking by parasitic nematodes in the infective and dispersal stages, which are analogous to the dauer stage in C. elegans (Ashton et al., 1999; O’Halloran and Brunell, 2003; Zhao et al., 2007). Nematodes can respond to both dissolved chemicals and volatile gasses. C. elegans dauers respond normally to many of the chemical attractants detected during the non-dauer stages (Ward, 1973; Cassada and Russell, 1975). However, Albert and Riddle (1983) reported that dauers failed to respond to sodium ions (Na+), which is a potent attractant for nondauers. Initiation of dauer recovery, by exposure to food, restored Na+ attraction, suggesting that chemotactic sensitivity to this attractant is impeded by the dauer’s cuticular features, such as the the buccal plug. Carbon dioxide (CO2) is a volatile odorant that is widely used for parasitic host tracking. In C. elegans, bimodal responses to CO2 are determined by the dauer arrest decision. Dauer larvae display attraction to CO2, while CO2 acts as a repellent to directly-developing larvae and adults (Bretscher et al., 2008; Hallem and Sternberg, 2008; Hallem et al., 2011). Attraction to CO2 is also conserved among infective larval forms of two insect parasitic nematode species, Heterorhabditis bacteriophora and Steinernema carpocapsae (Hallem et al., 2011). In all 3 nematode species, CO2 attraction is mediated, at least in part, by the BAG neurons of the nose (Hallem et al., 2011). Genetic analysis revealed that CO2 avoidance by C. elegans nondauers requires ets-5 which encodes an ETS-transcription factor acting in the BAG neurons (Guillermin et al., 2011). Dauers may have increased thermal sensitivity compared to nondauers. Warm temperature (27oC) leads to higher rates of dauer formation in wildtype animals (Ailion and Thomas, 2000). In addition, many genetic mutations with dauer-formation (Daf) phenotypes are temperature-sensitive, causing dauer arrest at 25oC but allowing normal development at lower temperatures (Gems et al., 1998). However, dauers have been shown to have dramatically reduced responses to noxious thermal signals (Wittenburg and Baumeister, 1999). Dauer animals fail to respond to noxious heat, whereas when dauers later recover to the L4 or adult stages, their response to noxious heat reverts to normal. These noxious signals are sensed by the highly branched nociceptor neurons in the cuticle, PVD and FLP (Chatzigeorgiou et al., 2010; Hall and Treinin, 2011). Thermosensitivity is an important aspect of the life cycle for Strongyloides stercoralis parasitic nematodes. The infective juvenile, a 3rd larval stage analogous to the C. elegans dauer, migrates towards warm temperatures, which may signify the presence of a susceptible host animal. Neural ablation experiments show that thermosensitivity in infective juveniles requires a pair of amphid head neurons (Lopez et al., 2000). These neurons may be analogous to the AFD finger neurons in C. elegans. In dauers, the AFD neurons may have more elaborated finger-like endings than nondauers (Albert and Riddle, 1983), although this feature has not been consistently observed (Procko et al., 2011). Dauer larvae have a tendency to remain motionless (Cassada and Russell, 1975; Gaglia and Kenyon, 2009) in either a rod-like or curved position (Gems et al., 1998, Lee et al., 2011). Pharynx pumping also ceases in dauers. In these ways, dauer behavior is reminiscent of larval behaviors during the intermolt lethargus periods (Cassada and Russell, 1975). Mechanical stimuli, such as jarring the medium or touching the animal directly, induce an immediate and fast-paced locomotory response as the dauer flees the area (Cassada and Russell, 1975). This rapid locomotory response shows that the dauer’s body muscles are fully functional and that the tendency of dauers to lie motionless may reflect a shift in neuromuscular signaling, rather than a decline in muscle functional capacity. Curiously, conditions that alter the level of dopamine signaling (either up or down) can stimulate movement in dauer larvae, without altering baseline locomotion in adult animals (Gaglia and Kenyon, 2009). This evidence points to dopaminergic signaling as potential factor regulating locomotory behavior in the dauer. Dauers are sometimes observed performing a unique behavior called nictation. Nictating dauers have an erect posture, balancing on the end of their tails with their heads swaying in the air (Cassada and Russell, 1975) (DBehaviorFIG 1 and DBehaviorVID 1). Nictation behavior is specific to dauers and is not performed by directly-developing larvae or adults. On laboratory growth medium, C. elegans dauers are frequently found nictating upon filamentous structures, such as fungal hyphae, which commonly contaminate the agar growth medium. 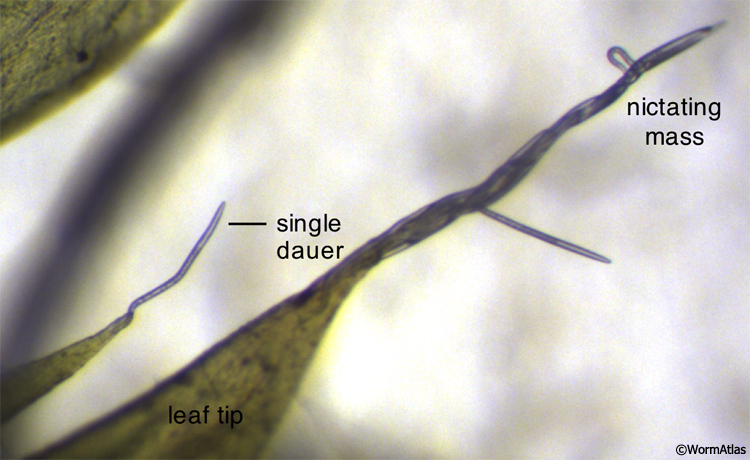 Dauers may also nictate as a mass, forming a structure resembling a waving stalk upon the substrate (DBehaviorVID 2) (Félix and Duveau, 2012). Controlled conditions for dauer nictation utilize artificial nictation substrates, such as medical cotton gauze and polydimethylsiloxane (PDMS)-based microfluidic structures (Lee et al., 2011). Nictation requires cholinergic signaling within the ciliated IL2 neurons (Lee et al., 2011). In C. elegans dauers, the ciliated endings of the IL2 neurons are covered by a thick body wall cuticle over the animal’s nose (see DCutFIG 5), and the distal channel to the exterior is filled or narrowed with excess dense material (Albert and Riddle, 1981; DHH, unpublished observations), possibly interfering with transmission of chemical cues that might be related to nictation. Even in wild type adults, the IL2 cilia are somewhat difficult to dye-fill (Tong and Burglin, 2010), suggesting that the IL2 cilium is less exposed to the exterior than other chemosensors. Rather, IL2 neurons may initiate nictation in response to mechanosensory stimuli indicating appropriate environmental substrates for nictation (Lee et al., 2011). Nictation initiation is a dauer-specific function of IL2s, since activation of IL2s was not able to trigger nictation in non-dauers. In addition to mechanical stimulation of nictation, photostimulation with electric lights can trigger nictation behavior in starved populations of C. elegans (Staniland, 1957). Nematodes demonstrate two strategies for foraging and dispersal. Nictation behavior exemplifies the ambushing, or “sit-and-wait”, strategy of host tracking and dispersal. The alternate dispersal mechanism utilizes cruising, or “widely-foraging”, in which nematodes actively explore their environment for a suitable food or hosts. While ambushing allows for targeting of quickly moving prey, (Huey and Pianka, 1981; Campbell and Gaugler, 1993), cruising is optimized for searching out sedentary, non-motile prey, such as rotting fruits. Nematodes in the Steinernema genus demonstrate an unusual variant of ambushing in which nictation is the first step of a more complex dispersal behavior. From a nictation position, an infective juvenile can bend backwards, progressively looping its body until the tail is flung away from the substrate, propelling the entire body towards the oncoming host (Campbell and Kaya, 1999; Hallem et al., 2011) (DBehaviorFIG 2). Jumping behavior in S. carpocapsae infective juveniles is stimulated by the presence of the nematode’s host, honeycomb moth larvae, but not by a non-specific cue, such as an air puff (Campbell and Kaya, 1999). Carbon dioxide gas can also stimulate S. carpocapsae jumping behavior in a BAG-dependent manner (Hallem et al., 2011). DBehaviorFIG 2: Larval nictation and flipping behaviors for dispersal. A. Nematodes in the dauer or infective stages are adapted for dispersal to new environments in search of fresh food sources or for attaching to a new host, respectively. Both needs require mechanisms for attaching to a vector or host animal, such as a bird or insect. B-D. Larvae perform nictation behavior to increase their height above the surface, increasing the chances of being picked up by a passing object, such as the bird’s claw or an insect’s body. E. S. carpocapsae infective juveniles also perform “jumping” behavior to become airborne, thereby acquiring a more secure attachment to the passing animal. The dauer animal has modified body structures to prevent normal feeding behavior, including a closed mouth and a somewhat withered pharynx. The pharyngeal muscles virtually cease pumping activity during dauer, although those muscles retain contractility. The pharyngeal muscles show altered responses to sensory cues, compared to other stages (Keane and Avery, 2003). In normal animals at any other larval stage or adulthood, light tail tap causes a brief halt (for several seconds) to the normal steady pumping of the pharynx when the animal is on food (Chalfie et al., 1985). A harsh tail tap in adults leads to a much longer period of inhibition, from which the animal only recovers slowly (Keane and Avery, 2003). Curiously, a harsh tail tap in dauers causes a brief stimulation of pharyngeal pumping (Keane and Avery, 2003). Both inhibitory and stimulatory responses are sensitive to mutations in unc-7, suggesting that gap junctions lie somewhere in the ill-defined behavioral pathway between the tail and the pharynx. We would like to acknowledge and thank Nathan Schroeder for his contributions and suggestions for this section.